The 22-year-old left Celtic Park to join CSKA, Bulgaria’s most successful club with 31 top division titles and 19 national cups, and has sampled the nation’s different culture at a relatively young age. “It’s been a really good experience so far. There’s a lot of different things about moving to a new country and it takes a while to get used to it. “I’m not too sure why so few (British / Irish players) do move abroad but I think over the last 2 or 3 years there have been more who have. “Bulgarian music is called Chalga music..and it’s terrible! I just keep my headphones on! Growing up in the 90s meant that the first music Cillian ever bought would probably struggle to make it onto many pre-match playlists! Born in Bailieboro, County Cavan, the Irishman played Gaelic football as a youngster before Gordon Strachan signed him for Celtic in 2006 and he also studied Applied Osmography at Strathclyde University. “I finished it with a degree, it’s an option anyway (for the future), there’s a big market for it I think. 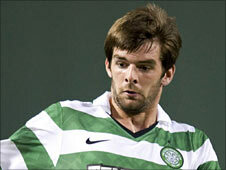 Cillian enjoyed a swift elevation to the first team at Celtic, making his debut in February 2007 against Inverness Caledonian Thistle in the Scottish Cup, grabbing an assist and subsequently signing a new contract two days later. As the dressing room music went at Parkhead it was a fellow Ireland international, also plying his trade at present in Eastern Europe (with Spartak Moscow), who played the pre-match tunes at first. Although the elder statesmen now managing at their respective clubs Alloa Athletic and Celtic, also got a say. Cillian scored 4 goals in 14 league games for The Bhoys, gracing the Champions League, and also spent time on loan at fellow SPL sides Motherwell and St. Johnstone (bagging 6 Saints goals in 16 games in the league), as well as Plymouth Argyle in The Championship. “At St. Johnstone we had a dodgy boombox so some tracks would skip! Either that or they were just really bad remixes! 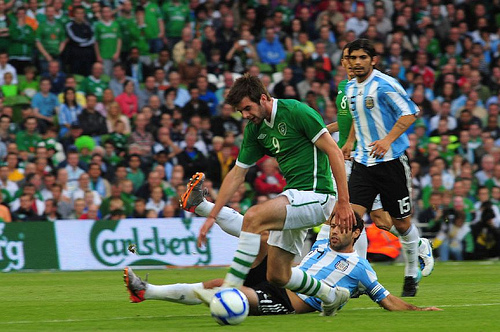 Giovanni Trapattoni gave Cillian his international debut against Paraguay in May 2010 and he has since gained two more caps for his country, against Algeria and Argentina. The striker has been the subject of much speculation this summer with interest from a number of clubs after managerial upheaval and limited opportunities to impress last season at CSKA Sofia. He has been on trial with Seattle Sounders and Portland Timbers in America’s MLS, as well as Hibernian where Colin Calderwood has been keen on signing him, but a postponed friendly with Barnsley on Saturday denied him the chance of a run-out. Still with the Bulgarian side, Cillian’s future is at present unresolved although he has two more years to run on his current deal. Prev Craig Hignett interview: Boro Brazilians’ tunes not to everyone’s liking!